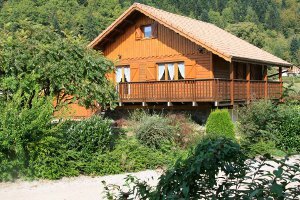 Our holiday rentals are located in Rochesson, a small and quiet village at the heart of The Ballons des Vosges Nature Park. 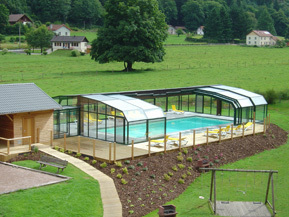 It is a peaceful place, ideal for your holidays in the Vosges. It is located 10 minutes away from Gérardmer and 15 minutes away from La Bresse, two pleasant tourist towns. This small mountain village is set at the very end of a valley shaped by a glacier. The Bouchot river flows through this 7-kilometer-long village, and can go wild when the winter snow melts, or after a thunderstorm. Our holiday rentals vary in size from 40 to 80 m2, and can host from 2 to 10 persons. They all have a view on the mountain, are very comfortable, and are adapted to disabled people. They are furnished with painted and decorated furniture, which allows our hosts to call them holiday chalet, cottage or holiday apartment. Equipment: oven, microwave, dishwasher, washing machine, dryer, vacuum cleaner, iron, food processor, coffee machine, TV, telephone, freezer. A 2000 m2-land is available, with picnic tables, barbecues, swings, ping-pong tables, football goals, boules pitch and an individual locker for ski gear, VTT, or whatever else you would need to store. A 15x5.80 m swimming pool is at your disposal throughout the year. It is heated and covered with a high shelter, which can slide off when there is a good weather. During winter time, another 9x4 m swimming pool is also available. It can have a counter-current swimming system.